Whether you've formed a recent friendship with a chicken farmer, or you've acquired a backyard flock yourself, knowing how to cook freshly butchered chicken is important for your dish to turn out well. Immediately after chickens are slaughtered, a process called rigor mortis begins. 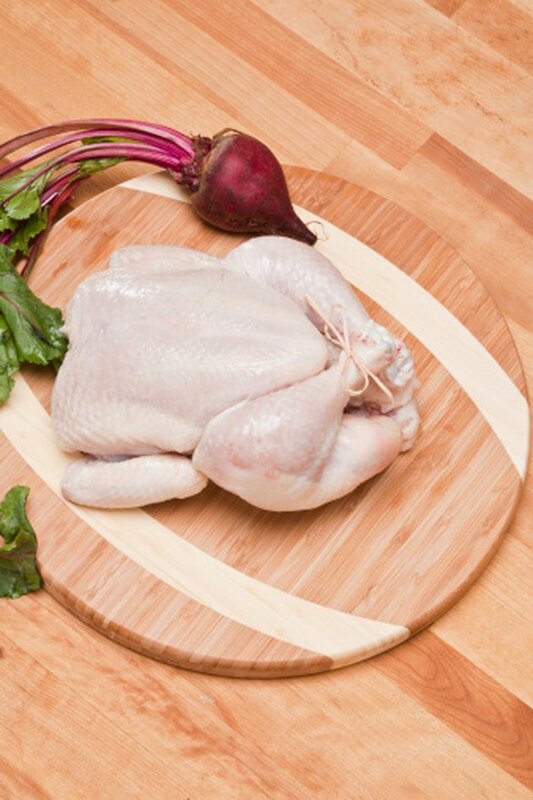 If the bird is cooked during this time period, it will be extremely tough and not pleasant to eat at all. Properly preparing and cooking fresh chickens will ensure that your money was well spent, or that your time was not wasted if you were brave enough to butcher the chicken yourself. Place the freshly slaughtered chicken into a large bowl with a lid that seals. If you purchased the chicken from a local farmer, he may have placed it in a food storage bag or wrapped it in plastic wrap after the chicken was cleaned. You still want to place it into a bowl to keep blood and juices from dripping into your refrigerator. Place the bowl inside your refrigerator for 24 to 48 hours. Allowing the chicken to rest will give the muscles a chance to loosen up before cooking. If you are pressed for time, 12 hours will suffice. Remove the chicken from the refrigerator and rinse inside and out under cool running water. Pat the chicken dry using clean paper towels. Season the chicken with salt, pepper and any other fresh or dried herbs or spices that you like. You can sprinkle the inside and the outside of the chicken but you can also separate the skin from the meat and rub spices in that pocket as well. Place the chicken into a roasting pan and insert into an oven preheated to 350 degrees Fahrenheit. Roast the chicken for 20 minutes per pound, plus 15 minutes. If you like crispier skin, start out at a temperature of 450 degrees for 10 to 15 minutes, then lower the heat to 350 degrees and continue to roast for 20 minutes per pound. Remove the chicken from the oven and check the internal temperature using a meat thermometer. The temperature should read 165 degrees to indicate the chicken is thoroughly cooked. If not, continue roasting for five to 10 minutes until the temperature reaches 165 degrees. Juices should also run clear when the chicken is cooked. For additional flavor, you can insert chopped onions, garlic cloves and fresh herbs into the cavity of the chicken before roasting. Trussing the chicken, or tying it prior to roasting, is optional. Roasting and frying are only recommended if your chicken is young. Older chickens are tough and should be cooked slowly, such as in the crock pot, over a period of several hours to soften the meat.